“The riots were brought to an end on the evening of Thursday, July 16, and the city immediately resumed its customary aspect, while the authorities proceeded to calculate the amount of damage that had been sustained. 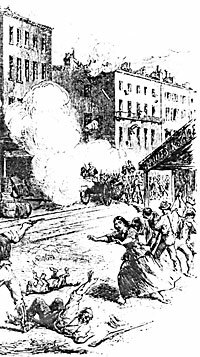 The exact number of rioters killed was never ascertained,” wrote Major T. P. McElrath.18 General John E. Wool, commander of the Eastern District, telegraphed General Henry W. Halleck on Friday morning, July 17: “I think we shall put down the riot in this city in the course of this day. We had a brush with them last night, and they were dispersed. 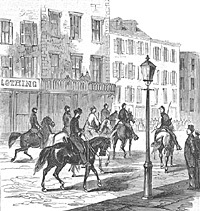 In searching their houses, we found 70 carbines, revolvers, &c., and barrels of paving stones. The numbers of the rioters are very great, but scattered about in different parts of the city, where they plunder houses whenever the opportunity offers, in the absence of troops. The several regiments which arrived yesterday afternoon and evening will, I trust, enable us to crush all these parties in the course of this day. The gallant and distinguished Brigadier General [Judson] Kilpatrick reported himself to me this morning for service for a few days. I have placed him in command of the few cavalry I have. 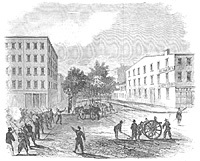 Iver Bernstein wrote that “it was General Dix’s wartime reputation as a relentless opponent of treason as Commander of the Maryland Department that won him the job of preserving order in post-riot New York. President Lincoln was committed to enforcing the New York draft — this was the message that Samuel Barlow received from T.J. Barnett, his Hoosier informant inside the White House. Lincoln and Stanton knew that General Dix would carry out the draft in New York at all costs. They no doubt also realized that Dix commanded the respect of metropolitan elites of all political stripes and would succeed, if anyone could, in mobilizing conservatives behind conscription and the post-emancipation war effort.”22 He was able to get the cooperation of Tammany Democrats for the August drafts. Iver Bernstein, The New York City Draft Riots, p. 54. William K. Klingaman, Abraham Lincoln and the Road to Emancipation, 1861-1865, p. 264. Abraham Lincoln Papers at the Library of Congress. Transcribed and Annotated by the Lincoln Studies Center, Knox College. Galesburg, Illinois. (Letter from George Opdyke et al. to Abraham Lincoln, July 21, 1863). Abraham Lincoln Papers at the Library of Congress. Transcribed and Annotated by the Lincoln Studies Center, Knox College. Galesburg, Illinois. (Letter from J. Jay, G. T. Strong, W. Gibbs, and J. Wadsworth to A. Lincoln, July 13, 1863). Noah Brooks, Abraham Lincoln: The Nation’s Leader in the Great Struggle Through Which was Maintained the Existence of the United States, p. 375. William Alan Bales, Tiger in the Streets: A City in a Time of Trouble, p. 136-137. William Hesseltine, Lincoln and the War Governors, p. 299. Stewart Mitchell, Horatio Seymour of New York, p. 324. Stewart Mitchell, Horatio Seymour of New York, p. 327. William Alan Bales, Tiger in the Streets: A City in a Time of Trouble, p. 137. Carl Sandburg, Abraham Lincoln: The War Years, Volume III, p. 362. Frank Klement, The Copperheads of the North, Lincoln’s Critics, p. 104. Milton M. Klein, editor, The Empire State: A History of New York, p. 436 (Paula Baker, “New York during the Civil War and Reconstruction”). Iver Bernstein, The New York City Draft Riots, p. 62-63. Annals of the War Written by Leading Participants North and South, Originally Published in the Philadelphia Weekly Times, p. 302 (T.P. McElrath, “The Draft Riots in New York”). Annals of the War Written by Leading Participants North and South, Originally Published in the Philadelphia Weekly Times, p. 302-303 (T.P. McElrath, “The Draft Riots in New York”). Iver Bernstein, The New York City Draft Riots, p. 59. Iver Bernstein, The New York City Draft Riots, p. 60. William O. Stoddard, Abraham Lincoln: The Man and the War President, p. 400. Philip S. Paludan, The Presidency of Abraham Lincoln, p. 289. Iver Bernstein, The New York City Draft Riots, p. 157. Stewart Mitchell, Horatio Seymour of New York, p. 332.